Montaigne wonders: when I am playing with my cat, how do I know that she is not playing with me? I admire that question not only for what it says about Montaigne but also for what it implies about the world. Animals are not dumb, insentient beings inferior in quality to human kind; nor are animals domesticated creatures whose purpose is to serve the will of human beings. Montaigne suggests that in their relations with humans animals act not only on motives of their own, but on conscious motives other than that of blind response or even fawning good-will. Over the years I have learned never to doubt the presence of consciousness evident on the faces of our cats, and have at times sought to discover their wishes and if possible even to satisfy one or two of them. Sometimes I have scratched them just where they itched, and sometimes I have sat myself down to read in just the chair they would have me occupy so that they could jump up on my lap and fall asleep with my text as their shield. Animals possess insight and ability that have some relationship to that of humans though I am certain that the nature of this relationship will remain forever somewhat opaque. I am perfectly comfortable with this state. Montaigne suggests that the world is pervaded by consciousness (my beloved transcendentalists will develop this idea) but he implies that we humans have limited capacities to understand much beyond our own minds, and even that with incredible difficulty and resistance. I have avoided eating meat for almost thirty years now. In Genesis God accedes to meat-eating with reluctance. We are, after all, all God’s creatures created equally. But there was no single motive for my vegetarianism, but rather a constantly evolving sense that I did not want to eat anything that could look back at me, and that raising animals merely to be eaten was somehow wrong. Once a year and always on Thanksgiving, I succumbed to turkey dinner. This began as a politically correct move to accommodate family matters, and the habit has continued for reasons too complex to consider here at present. I suppose for this discussion the couch would be a more appropriate venue, but I haven’t found the right one for years. 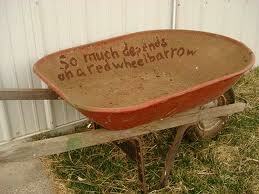 And I have learned that so much really does depend on a red wheelbarrow. In this case, I think a clue might have been the squirrels. It was a lovely backyard, in fact. For city property, it appeared normal in size. Most city residential lots consist of about ¼ acre, and the footprint of this house (I love that term) occupied a considerable portion of this area. In the rear of the structure, resting between the garage and the house-proper was a piece of land approximately thirty by forty feet, in the middle of which towered a beautiful, very large, old tree of unknown type (unknown to me, at least: I subscribe to Fran Leibowitz’s sentiment that the great outdoors is lovely . . . so they tell me). And from this relatively unformed space, she began to plan a landscape. I didn’t really think much of the project—that is, I didn’t give it much thought. As John Lennon said, “Whatever gets you through the night . . .” But then there began to appear cages spaced throughout the yard, and when I inquired as to their purpose, she informed me they were meant to catch squirrels. These outdoor bushy-tailed rodents were disturbing her ordered plan for the site. But these were not cages; they were, in fact, traps. A dollop of peanut butter would be placed in each trap and the unsuspecting squirrel would stop in for a snack; a mechanism would trip and the door would close on the squirrel. The animal, now panicked, would begin to shriek and squeal and flail desperately but despairingly about the tiny cage searching for some hope of egress. But none appeared. And when she became aware that her traps were sprung, she would lift them one by one and immerse each into a garbage can filled with water and drown the imprisoned animal. How—or why—could one sit in peace in a yard, no matter how beautiful, littered as this one was with the remains of drowned squirrels?